If you’re looking for a land art destination now that the Desert X Mirror House is being dismantled, I suggest taking a drive south past the Salton Sea to see Neal Lucas Hitch‘s straw bale observatory. The lunar viewing pod is “an extension of the desert” that takes you upward into the stars and away from selfies and modern culture. Palm Desert artist Jack Rowe was a lifelong influence on Jim Toenjes and other desert painters. I never met Jack, but felt I knew him after hearing Jim recite his color theories word-for-word. The artist who lived in a dome house in Palm Desert died November 21, 2017, at age 97. While he studied at the Art Institute of Chicago and worked as a commercial illustrator, his shining legacy was as a teacher. “Each time my students won awards, I felt as if ‘the dome’ had won also,” Rowe once said. 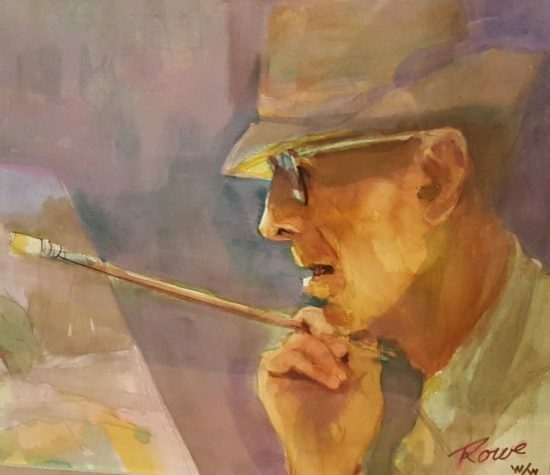 Diane Wittman-Punteri wrote with rare biographical information about her dad, Karl Albert, one of a core group of painters from the Desert Art Center. 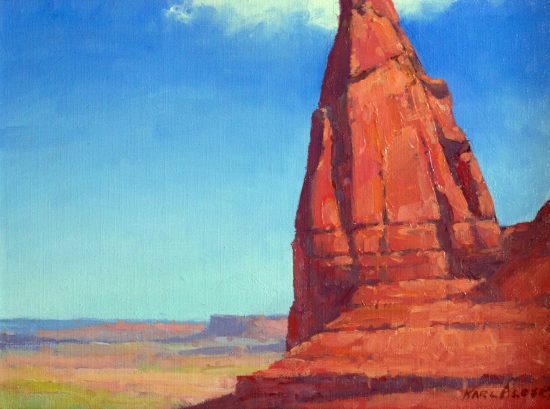 Karl and his buddies–Darwin Duncan, Wilton McCoy and Don Miles–deserve more notoriety as skilled landscape painters who inspired the next generation of desert artists. In the 1930s, Karl Albert began painting while working as the postmaster in Oro Grande–a small town near Victorville that was also home to Bill Bender. He went on to study with respected California painters Edgar Payne and Sam Hyde Harris. Prior to his death in 2007, Karl shared a trailer home with Darwin Duncan–his friend of 70 years–at the Silver Spur Mobile Manor in Palm Desert. The two aging artists painted plein air in the nearby desert that was later obliterated by Big Horn Golf Club. Diane will be sharing more about this overlooked Coachella Valley painter. In the meantime, she’s selling a piece he did on a trip they took together to Monument Valley. Karl Albert called it Ad Astra Aspera, a Latin phrase meaning To the Stars by Hard Ways. This website recently featured the influential Palm Desert artist Susan Smith Evans who died in an accident at her home in March, 2017. It was her husband, Ron, who showed me around the home he and Susan shared in the Cahuilla Hills. He was effusive about his late wife’s work and talked about efforts to continue her legacy. Then, in November, just eight months after Susan died, Ron passed away in his sleep. Ron Evans was a former College of the Desert professor of ceramics and pottery. With the passing of these two artists and teachers, an epic story of art and homesteading comes to a conclusion. For inquiries about the work of Susan Smith Evans, contact The CREATE Center for the Arts in Palm Desert. Edan Hughes started collecting California art as a hobby; it became his magnificent obsession resulting in the 2-volume encyclopedia “Artists in California” Any time you find biographical information about an obscure desert artist on eBay, you likely have Edan Hughes to thank. After Hughes’ death in 2015, his lifelong friend Wayne Smith took over his collection. The old website is shut down and a new site (still under construction) shows Hughes’ early California paintings for sale. There’s an entire section on the desert, and there you’ll find many names worthy of a deeper look and further research. 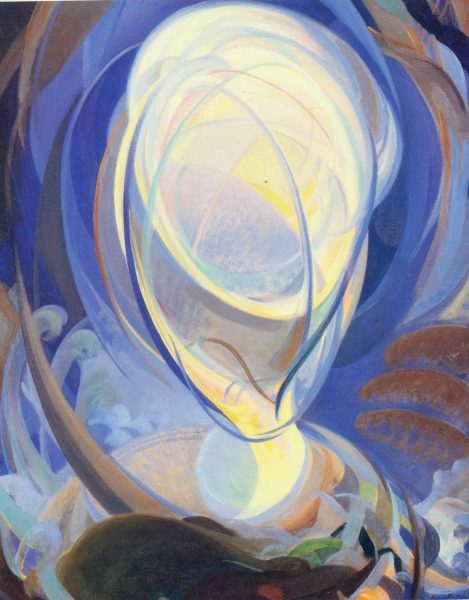 Agnes Pelton continues her ascendancy with a traveling survey exhibition curated by the Phoenix Art Museum. Desert Transcendentalist is due to open first at the Palm Springs Art Museum in 2019, according to Phoenix Art Museum spokesperson Margaree Bigler. The exhibit will then travel to other venues, winding up at the Phoenix museum. More details here as they become available. 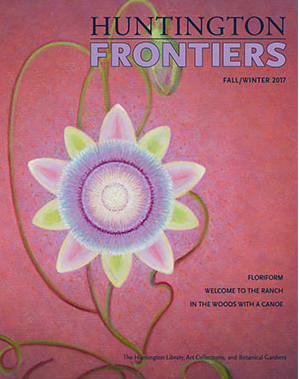 The former Cathedral City resident also recently scored the cover of the Huntington Library’s magazine Frontiers. The museum’s recently acquired Pelton painting Passion Flower graces the cover. An accompanying article by James Glisson discusses the work of Henrietta Shore, Agnes Pelton and Helen Lundeberg–three modernists who all engaged with the California desert. In yet more momentum for Pelton, the Los Angeles County Museum of Art recently purchased her Lost Music, II, an abstraction inspired by a desert sandstorm. Finally, a Pelton mystery for you to solve: John Schlag is trying to locate Pelton’s Being, a 1926 painting last seen displayed in the lobby of Southwestern Bell in San Antonio Texas. If you spot the Being roaming around Texas, contact jschlag.me@gmail.com. Joseph Yoakum is not a desert artist in the usual sense but the self-taught painter did travel here in his dreams. The House, of Great Joy Palm Springs (with its idiosyncratic comma) shows a suburban home in a lush setting that looks nothing like Palm Springs. Then there’s Yoakum’s Mojava Brook and a strange and inspired rendition of the Imperial Valley. For all the odd spelling and alien flora we can trust Yoakum’s dream topography. 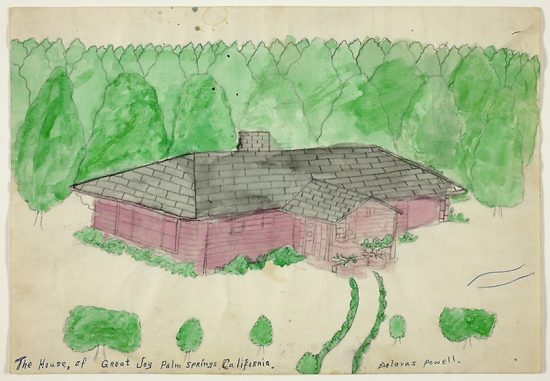 The outsider artist became famous for imagining landscapes of places he had never seen in person. Yoakum is one of the stand-out stars of a National Gallery of Art Exhibit opening in Washington January 28-May 13, 2018, then traveling to the LA County Museum of Art in November, 2018. Outliers and American Vanguard Art (a book by Lynne Cooke accompanies the show) is a starting point for discovering other unknown outsider artists. 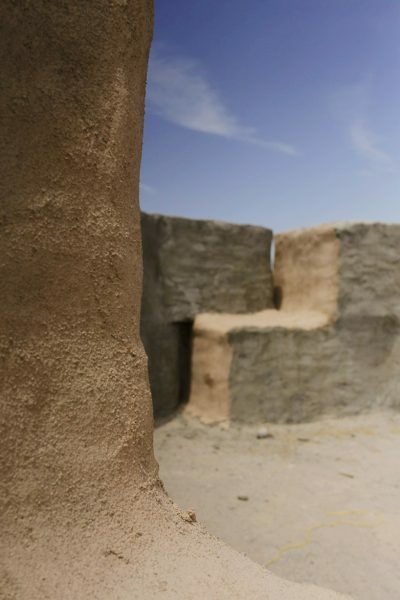 The desert–with its long tradition of eccentrics and hermits–is especially rich hunting ground. An exhibit by three Santa Fe artists is on view through January 28, 2018 at the Borrego Art Institute. 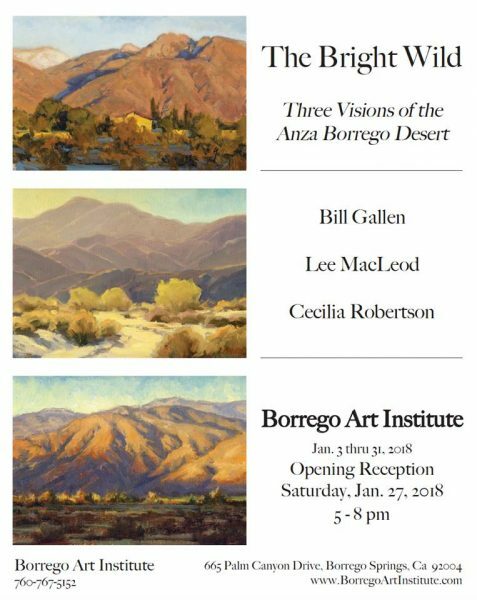 The Bright Wild includes interpretations of Anza-Borrego by Bill Gallen, Cecelia Robertson and Lee MacLeod. Gallen is also teaching a two-day plein-air workshop in Borrego January 28-31. You can meet the artists at a closing reception January 27, 2018 from 5-7:30 pm. If you haven’t yet made the trek from Palm Springs, consider this an option for a wide-open winter’s drive and a visit to a stylish gallery. Eric Merrell’s work is appearing for the first time at the Masters of the American West exhibit at the Autry Museum opening February 10th through March 25th, 2018. 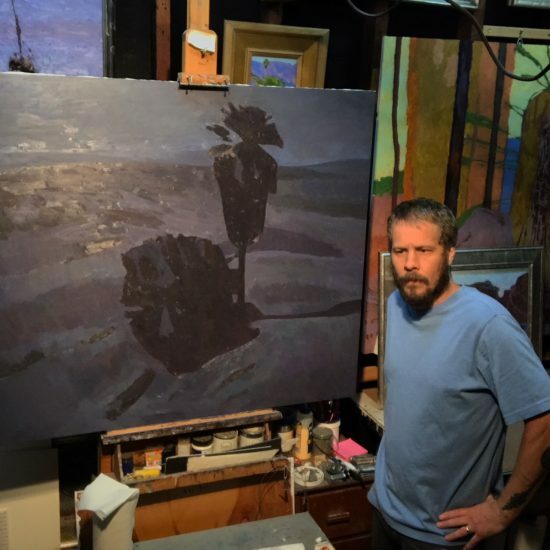 His pieces to be shown include views of Snow Creek and the Salton Sea as well as one of his famous nocturnes. The painter’s talents run to literature as well as art. Not surprising, then, that he has written a poem to accompany the nocturne. Eric’s words give you a feeling for what it would be like to paint “on this side of midnight, in the desert by a seep.” No one has written about desert colors so attentively since, perhaps, the venerable J. Smeaton Chase. Then subsides into blue; indigo slows, rearranged. 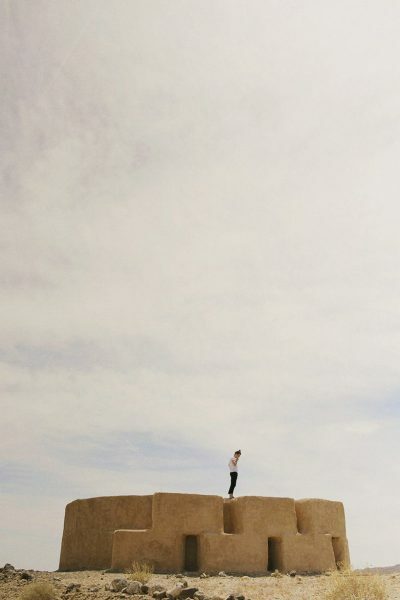 The desert remains in this watchful half-light. Where the bright and declining horizon resides. Formed simply, purely, of day fitting night. Barely detected across murky expanse. Familiarity departs, undiscerned in the haze. Unknowns emerge, the known then takes pause. Vast diffuse mud hills blur through the gauze. Then re-form on the margins faded and near. Within a silent land, night-shrouded and still. Bunched together, living, but from quiet molded. Clarity rustles close from a neighboring heap. Something does exist here on that near mound. Becomes formless night, while entirety lies hushed. Fascinating mix of news/art and inspiration. Thanks Ann! no place else, but your site, to be enlightened by such inspirational news, thank you! dear ann. i could give karl albert’s ad astra aspera a good home…$igh. am “heartened” of the synchronous news of ron evans passing and thankful that he and his beloved forever susan are reunited. came back to read eric merrell’s “a moon of unusual brightness”, wonderfully soulfully nourishing!